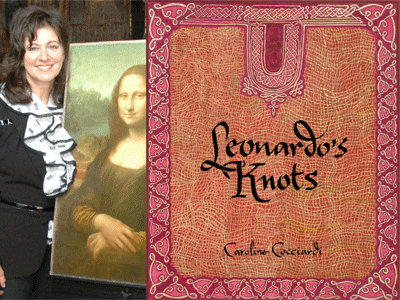 In honor of the 500th anniversary of Leonardo Da Vinci's death Caroline Cocciardi joins Books Inc. in Campbell to share her fascinating and beautfiul work, Leonardo's Knots. Caroline will be bringing an exact replica of Mona Lisa as seen in the Louvre Museum in Paris France! Leonardo's Knots will introduce you to a facet of Leonardo da Vinci that you have not seen before. Found in the minuscule details of his works yet it speaks volumes about his passion for knots and mathematics. Leonardo da Vinci masterpieces included a knot; Mona Lisa, Bella Principessa, Annunciation, Lady in Profile, The Last Supper, Salvator Mundi, Isabella D'Este, Lady with the Ermine to name just a few. The art book takes you on a picture journey through Leonardo's career in knots (1480-1518) like you have never seen before. Documented with 142 illustrations Leonardo's evolution from traditional knots (aesthetically appealing and ornamental), to mathematical knots (patterns that tell a story within his art). His combined expertise in art and mathematics gave him the unique ability to translate these miniscule, interlaced wonderments into the glorious visual beauty found in his artworks. Leonardo's Knots with the collaboration of fine artists, graphic designers and knot mathematician/artist Rob Scharein PhD have transformed Leonardo’s Knots with 21st century technology revealing new meaning in two lines intertwining.